It was my first visit to Hangzhou. In one and a half days, I hurried through more than ten scenic spots. 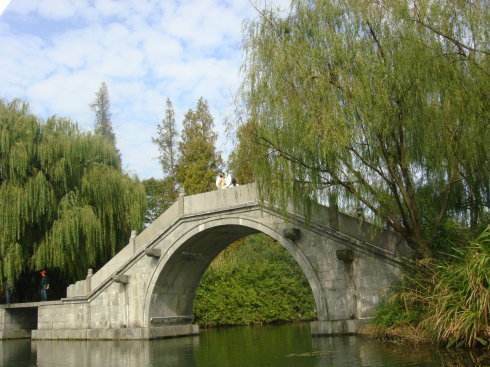 The West Lake in spring is gracefully pleasant, its beauty unparallelled. Walking along the lake, I saw willows bowing in shiness. The water is so blue. The pavilions throw their shadows in the water. What is most impressive is the blooming peach flowers vying with each other in showing their beauty. The tea bushes, the screens and quiet bamboos are left in my memory. When I walked for half an hour in the sun and suddenly saw a stretch of bamboos I could not help crying out, "I'll go and sit in there." After three hours' walk a murmuring stream came into my view. The water was clear and I could see through it to the bottom. The oval stones under the water were visible and even countable. I put my aching feet into the stream. Oh, the water was running across my feet. It was cool but not cold. I could not but admit that it was a most pleasant and comfortable moment. Life is just like a journey. What is more, you have to hurry on the way, braving the scorching sun and burdened with luggage, while crossing over the mountains and slopes. Then you feel rewarded by a short rest. If only I could walk less and rest more!